Disembark at New Mal junction if you are traveling by train and hire a car to arrive at Samsing which is only 34 kilometers from the junction. Do not forget to negotiate the fare with the driver. Suntalekhola is uphill about 4 kilometers from Samsing. The entire route is charming with lush tea gardens, mountains and small streams. You can feel the nature here and breathe some fresh air. The Bagdogra airport is around 75 kilometers from Suntalekhola. You will find the deluxe cottages as soon as you cross the check post. There are 4 tents which are names Cruiser, Popinjay, Windmill and Swiss Spangle. The tents are well facilitated for camping. There are attached bathrooms with geysers and also mini steel wardrobe along with dressing units. They also provide fan and light inside the tents. They serve to the guests as well and you can have chicken at dinner. A plastic table and chairs are furnished inside the tent for the guests to use. The Swiss Luxury tent comes at 1200-1400 INR and the Nature Education and Wilderness Resort with 2 bedrooms come at 1100 INR and the suite at 1500 INR. The reservation can be done at the forest department office. You will have a close contact with nature and explore it at your freewill. There is a suspended footbridge in front of the camp area which leads to the Suntalekhola Nature Resort. Here, you can spend time amidst beautiful and colorful flowers and enjoy the sight. Coming so close to nature also provides an opportunity to bird watching. This place is famous for that and you will find Golden-spectacled and Chestnut-crowned Warblers, Orange-bellied Leafbird, Grey Nightjar, White-naped and Black-chinned Yuhinas, Long-tailed Sibia and many more. 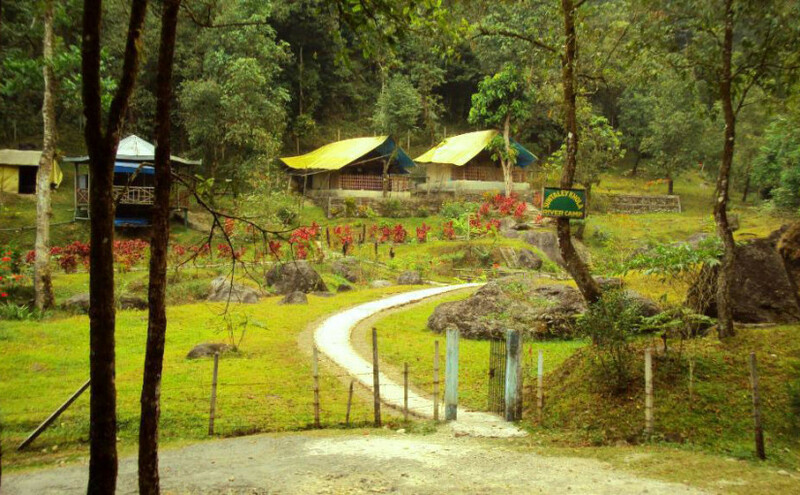 Apart from bird watching you can trek to the entry point of Neora Valley National Park known as Mouchuki which is 6 kilometers trek from Suntalekhola. This entry was posted by indispottravel in Dooars in West Bengal, Forest Bungalow in West Bengal, Jungle Safari in West Bengal, Picnic Spots in West Bengal, Weekend Destination around Kolkata, West Bengal, Wildlife in West Bengal and tagged accomodaion at Suntalekhola River Camp, Attractions at Suntalekhola River Camp, bedrooms availability at Suntalekhola River Camp, bird watching at Suntalekhola River Camp, cost of living at Suntalekhola River Camp, cost of Luxury tent at Suntalekhola River Camp, cost of Suntalekhola River Camp, cottages at Suntalekhola River Camp, distance of Mouchuki from Suntalekhola, distance of Neora Valley National Park from Suntalekhola, distance of Suntalekhola River Camp from Bagdogra airport, distance of Suntalekhola River Camp from NJP, distance of Suntalekhola River Camp from Samsing, distance of Suntalekhola River Camp from Siliguri, dooars, dooars in west bengal, elephant, elephant ride, elephant safari, elephant safari at dooars, elephant safari in west bengal, elephants in west Bengal, fooding and lodging at Suntalekhola, Forest, Gorumara National Park, hotel samsing dooars, hotels at Suntalekhola River Camp, hotels in suntalekhola, how many tents are available at Suntalekhola River Camp, how to go to Suntalekhola River Camp, how to make reservation for Suntalekhola River Camp, how to reach Suntalekhola River Camp, jungle, Nature Education Resort at Suntalekhola River Camp, Neora Valley National Park, orange stream, orange stream in west Bengal, procedure of Suntalekhola River Camp reservation, reaching Suntalekhola River Camp, reservation of Suntalekhola River Camp, resorts at Suntalekhola River Camp, room rent at Suntalekhola, samsing in north bengal, south eastern entry point of Neora Valley National Park, starting point of trekking, staying at Suntalekhola River Camp, staying options at Suntalekhola River Camp, Suntalekhola, suntalekhola accommodation, Suntalekhola altitude, Suntalekhola height, suntalekhola hotel booking, suntalekhola hotels, Suntalekhola location, Suntalekhola Nature Resort, suntalekhola resort, suntalekhola resort booking, Suntalekhola River Camp, suntalekhola wbfdc resort, suntaley khola, tents accomodation at Suntalekhola River Camp, tents at Suntalekhola River Camp, tents availability at Suntalekhola River Camp, tourist spot at sultane khola, trek distance of Mouchuki from Suntalekhola, trekking at Suntalekhola, trekking routes originate from Suntalekhola, trekking to Neora Valley National Park from Suntalekhola, tribal dance, WBFDC cottages at Suntalekhola, what to see at Suntalekhola River Camp, where to stay at Suntalekhola River Camp, Wilderness Resort at Suntalekhola River Camp.